In FMA (Filipino Martial Arts), learn arnis sparring is one of the most crucial aspects of training. This seems like an obvious statement but in the FMA world, there are groups and several systems that do not include sparring in Eskrima as part of their training program. Rather, numerous FMA practitioners spend time and energy learning flow drills. Of course, flow drills are important as well. But nothing can replace sparring and truly be getting there. It is crucial to engage in actual combat exchange with another human being. Sparring aids you to develop a practical and realistic sense of timing. It teaches you how to execute moves involuntarily under stress, and also helps you determine what your escrima fighting skills truly are. So if you want to become excellent at combative exchanges, you have to practice and involve yourself in sparring matches. I have to make one thing very clear. Again, “sparring” is not “fighting.” Unfortunately, many practitioners of the martial arts world consider sparring as similar to fighting. That’s not true, and if you’re treating sparring in the same way as brawls or fights, then you are not learning anything; your skills will not improve. At least the way some Filipino Martial Arts groups view it, sparring is just another drill in their regimen. But the sole difference between sparring and other drills is that sparring in some groups are a spontaneous, active drill that includes combative exchanges. In sparring, they can go as light as they want, or as hard as they need to be. But it is crucial to deem sparring as a way to develop your skills and that of your training partner’s, and not just a way to engage in fights for the sake of ego or toughness. Filipino Martial Arts practitioners performing on TEDx. One of the most crucial sparring rules is to respect the weapon of your opponent. It does not matter whether you are sparring with rattan sticks, foam sticks, or training blades. Treat your opponent’s weapons as though they are actual weapons that can severely injure you if they come into contact with your body. By respecting what the best escrima sticks represent, you’ll be more prepared in case actual attacks occur on the street, where machetes, pipes, baseball bats, and knives aren’t as forgiving as your training blades and sticks. Another thing to remember during sparring is to avoid trading blows, especially if you’re using body armor. A lot of people depend too much on protective gear and thus end up receiving blows to the head, which can be dangerous. Also, it is crucial to use the armor for safety measures, but not as a garment to trade. Such recklessness doesn’t develop your skill and you will learn nothing by engaging in such a careless match with blades or sticks. Kid holding a practice blade. One excellent way to spar is to do it lightly. I am certain that a lot of you will scoff at this idea. But sparring lightly, in fact, develops the accuracy, precision, and the skills required to fight effectively. Also, sparring slightly is, in fact, one of the ideal forms of sparring, irrespective of the practitioner’s skill level. Learn to control the energy of an actual, committed attack. It is crucial to spar hard from time to time. But it is not always required to go full-contact at 100% in every session. Personally, I like to change the force throughout a sparring session, beginning at 25% intensity, and working up to 50%, then ultimately to full 100%, and then bring the level of intensity back down. This will make sure that you are still moving with energy and intent, and not seeing the session as a brawl. When sparring, it would be best if you mix things up. Occasionally, forgo the stick-to-stick exchange for a stick-to-knife exchange, or for a staff-to-double-stick exchange. Sometimes, fights happening on the streets involve these weapons, so integrate mixed weapons sparring in your training. Another crucial aspect of sparring is to change the place where you train. Try to train on the sand, concrete, ice, mud, or wooden floors. You will notice how you need to alter your movements to adapt to an unusual or new terrain. To be sufficiently prepared for an actual fight, you have to practice sparring on different surfaces. Get the necessary equipment such as sticks, gloves, armor, etc. But you also have to pick up a couple of these essentials such as a groin protector and gum shield or chest protector. And if you wish to spar long term, pick up your own helmet for sparring with sticks, or boxing gloves when performing boxing sparring matches. Ask your instructor for the right gloves for you. Note that arnis sparring is all about techniques and fielding tactics against a moving, resistant target. It is not an actual fight. No one is here to punch anyone, and those that become egotistical usually don’t last long. Sparring is a tool for training that aids to improve and test a practitioner’s skills. Also, it is crucial to note that sparring – while helpful in developing skills like timing, ranging, accuracy, etc. – isn’t a simulation of actual combat. It’s only a training tool. Just have fun, and revel in exploring and applying what you learned. If you’re physically able and fit, then you will certainly get more out of sparring. But if you are tired, ill, or injured, then sparring can become more of an exercise that training. Moreover, the extent of the technical knowledge you have has very little to do with performing successfully. Instead, it’s down to the effective application of the limited know-how you have. Eventually, you will naturally get new tools to use, but you have to ruthless in evaluating their quality if they’re to be used. One area your system needs to be looking at is establishing a game plan. At its most basic level, it takes in your understanding of what makes up the victory and attempting to achieve it while preventing your enemy from getting their victory goals. However, at a tactical level, it takes in observations of your opponent’s behavior as well and employing the proper tactics to beat them. 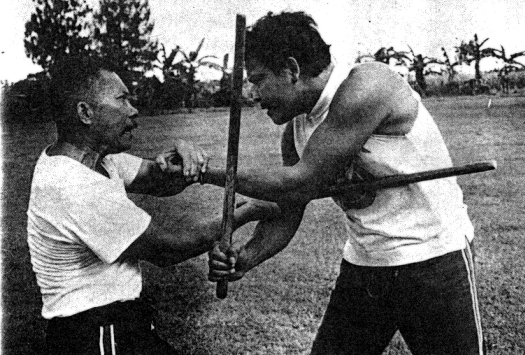 This post aims to explain the primary goals of sparring in Balintawak Eskrima. The objectives are to develop and enhance speed and accuracy, coordination and balance, as well as become familiarize and better when it comes to perception and the use of proper tactics of the martial art. Learning these can allow the practitioner to master the objectives and utilize them in sparring and actual dangerous conditions. In this system’s discipline, sparring is termed as fighting in practice between two equitably skilled practitioners of the system in a mutual exchange of offensive and defensive maneuvers in arnis sparring; performing all appropriate methods of the art. Grandmasters of the single stick Filipino martial arts performing arnis sparring. To enhance the accuracy and speed of the reflex action. These two qualities set off each other. To develop coordination and balance of the body’s various parts and movements; the human weapon. To become acquainted with the condition, triggering real combat. To develop accuracy and speed of perception regarding the Mushin principle. To generate the excellent result in the use of appropriate methods at the proper distance and right timing. If the objectives such as developing and enhancing speed and accuracy, coordination and balance, as well as familiarizing, and becoming better at perception and the use of proper tactics of the martial art is achieved, then the practitioner is ready for further instruction. Practice these goals, and you will notice how your moves differed from before. To sum up, it is crucial to integrate sparring into your FMA training. But it’s even more crucial to spar properly. And by learning to spar the right way, you’ll notice how your skills have improved and you’ll see where you are with your skills. You will be better prepared as well in handling actual combat exchanges. The FMA was originally based on fighting, so sparring is a great way to develop your fighting skills.